That Europe is full of anti-Semitic incidents doesn't surprise me. That Israel finds neo-Nazis in our midsts from all the non-Jewish Russians we imported (due to a stupidly written law that should be changed) doesn't surprise me. That the neo-Nazis beat up old women because they are Jews or destroy Jewish structures doesn't surprise me, because the government and the police in Israel are known to do the same exact thing. But when I hear of it happening in, of all places, New York. That surprises me. One tends to think of New York as a safe haven for Jews. Where the Rule of Law is enforced (for real), and the rights of Jews to live in peace is protected and guaranteed by law. But I guess, sometimes the rats come out of their holes, and don't get stomped on fast enough. Time for some rat poison, I'd say. In the meantime, from what I've seen and from reports in the field, the 5 new Jewish villages seem to be coming along fine. True, in a few days the government will knock them down. But the Jews will go up again. After all, when Abbas demands 100% of Judea and Samaria (and Olmert caves in), it will only be us that prevents the enemy from taking that next step to phasing out Israel. We have no choice, but to continue to fight for our land. Just a reminder for everyone visiting in Israel. You can rent a GPS for cheap at DadyGPS. Click here for details. Or call 02-624-0447 and ask about the 'WebAds' discount. Don't get lost in Israel - Enjoy your touring with DadyGPS. Jews suddenly become carpenters and construction workers, and don't hire out laborers to add on a room for them (on the other hand the ceilings do tend to leak in the rain). It used to be when you walked around Meah Shearim you'd see unusual (unless you grew up in America) winter-themes decorations being sold for the Sukkah. Ho. Ho. Ho. Merry Sukkos. With Sukkot coming up fast, there are tons of new archeological findings that have been discovered in the past few weeks. I hope they are open to the public and when you visit Israel you get a chance to see them. If anyone knows of meore, please add them to the comments section. And of course, DON'T GET LOST. Rent a GPS in Israel from DadyGPS. Mention JoeSettler "WebAds" and get a big discount. You could mention JoeSettler, but that and 5 shekels will buy you a cup of coffee. No, not the war with Syria, the other war. The war for Eretz Yisrael. Olmert and cronies are planning on selling out Israel (again), and a few people have dared to stand up and shout about it - prompting a new round of political arrests and persecutions. Read this important article by Nadia Matar for more on what is going on. My friend called me up and asked me what I think he will be eating before Yom Kippur. I said, "I don't know". Israel is increasing its forces along the Syrian border, in preparation for a potential attack over Yom Kippur. I hope now that Syria failed in arming their chemical (nerve gas) warheads or prepare their nuclear weapons that the possibility of war has been reduced. But until after Sukkot, I'm not placing any bets on that. I saw a link to this on Hirhurim. How many seeds are there actually in a Pomegranate? Surreal seems to be a word I use way to often when describing Left wing governments in Israel. It’s now being reported that on July 23rd, dozens of Syrians died (horribly), when the nerve gas (Sarin) they were installing on a Scud (to be launched at us in Israel) exploded killing dozens of Syrian engineers and scientists (good). This is being revealed on the heels of the reports that North Korean attempted to help provide Syria with Nuclear weapons. Meanwhile (surreally) Olmert declares he has great respect for the wannabe Mass Murderer Assad and is willing to capitulate (out of fear) to his demands. I’d say its election time in Israel, but do we really get a choice, and what does it change? I wish Ha'aretz could decide. First they report that IDF soldiers, during a mission in a West Bank town shot and killed an unarmed 16 Arab young man. But as you read the article, you clearly see that the young man in question was hurling rocks at the troops. Which one is it? Was he unarmed, or was he hurling rocks? We're not yet in an active state of war with Syria, but don't think that the holidays passed without incident. Arabs shot up a vehicle in the Shomron (injuring the Jewish occupants), an there was an infiltration attempt into another Shomron community. In case war with Syria breaks out over the 3 day holiday, check in after Shabbat and I'll update you all about it... unless I'm busy fighting. Peres still doesn't get it. Is it any wonder that Peres brought us into our current situation after he made today’s comment? In his first comments on the subject since Tuesday morning's Kassam rocket attack which left 69 soldiers wounded, President Shimon Peres voiced wonder at the Palestinian terror groups' decision to continue with such tactics. "It makes no sense why they would continue to shoot at us despite the fact that we disengaged from the Gaza Strip," Peres said during a Rosh Hashana toast for foreign diplomats. No Shimon. It makes no sense to you. The rest of us on the Right understand it completely, which is why you need to retire in shame for all the deaths your idiotic policies have brought onto our collective heads. And it is why your (and the Left's) continued attempts at peace need to stop immediately. Meanwhile there is nothing new in the leaked reports on what Olmert and Abbas have agreed on. Israel gives up more and more territory and control, including parts of Jerusalem and apparently the Temple Mount, and gets rid of Jews from Judea and Samaria. Abbas in return promises to stop terrorism. Haven't we seen this movie too many times already? The IDF has a problem. Two actually. Well three if you count Olmert. As much as they say they are ready for a war on two fronts, no one really wants to have to fight that way. It's no secret that tensions are high with Syria. Newspapers are reporting that Syria has called up reserves. If there is going to be a war, it is going to be by the end of Sukkot. And then we have the Palestinians Authority in Hamastan/Gaza. I personally doubt that the Palestinian Authority was even aiming for the soldiers. They were probably aiming for the power plant right next door. Can you imagine the results if they actually hit the wrong place over there? Can Israel really afford to not react to today's attempted massacre? Exactly which Muqata did you mean to go to? Last week, some soldiers made a wrong turn and nearly found themselves lynched in PA occupied territory. It’s not the first time this has happened either. There is really a simple solution to this problem. If you see big red signs saying “Don’t Enter”, well, then don’t enter. But there is another alternative. dadyGPS is offering a special deal for publishers in the WebAds network (that’s me) and our readers (that’s you). You can rent a car GPS in Israel for as little as $12 a day, or $50 for the whole week (that comes out to just a little more than $7 a day). (Normally the price is more like $15 a day). Isn’t that peace of mind, knowing that you won’t make that wrong turn into PA occupied areas, (or Syria) well worth it? OK, I admit, that was a scare tactic. The reality is that having a GPS in Israel can be quite useful if you are visiting or going touring. The catch, you just have to mention WebAds when you talk to them. Not a bad trade at all. This Land is Our Land? Translated from the article in Israel's Makor Rishon newspaper. Rosh Hashanah 5768 is rapidly approaching, and according to news reports, the IDF is preparing a massive troop incursion into Gaza. I don’t know if anybody is counting the IDF incursions into Gaza, but one thing is clear: every incursion is followed by a retreat. The situation in Gaza is strikingly similar to the situation in Lebanon. It is a pendulum that swings back and forth between two impossible poles. We can’t enter because it is not our land and we will rapidly lose international support to remain there, and furthermore, nobody wants to face journalist-turned-Labor MK Sheli Yechimovitch and the Four Mothers. But we also can’t stay out, because Kiryat Shmonah and Sderot are part of our land and we ultimately have to take care of their security needs. This is not a military question. It is much more basic. Is this our land or not? Maybe in 5768 we will finally determine the answer to this simple question. We have certainly done our utmost to solve the Arab problem on the basis of the assumption that this is not our land. The Oslo Accords and their aftermath have been one long attempt to work with the assumption that this land is their land. Since the infamous Arafat-Rabin-Clinton handshake on the White House lawn, we have paid for this assumption with close to 2000 dead, tens of thousands of wounded, a horrific Expulsion and devastating despair. What people think about less is how much it costs us. Some simple calculation reveals that the solution based on the assumption that this land is not our land costs us about 200 billion dollars per decade. The cost of the security guards at the entrance to every café makes up 15% of this sum, which does not include protective roofs in Sderot and various anti-Kassam mechanisms. We can continue to spend these colossal sums on the same, failed assumption. We can continue to invest the 200 billion dollars in making the Separation Fence high enough to prevent Kassam missiles from flying into our towns. Or we can invest in a revolutionary, outrageous, unthinkable solution, based on the outlandish assumption that this really is our land. We can use the same amount of money to encourage Arab emigration from Judea, Samara and Gaza and to compensate them for their homes. (No Expulsion, G-d forbid. That is something that we only know how to do to fellow Jews). According to findings published by Bir Zeit University, the vast majority of Arabs living in Yesha would be more than happy to escape the clutches of the terror thugs that the Oslo Accords have created, and to find a better future in a different country. According to research by Yoram Ettinger and his staff of demographers, this process is already taking place. That is why the Moslem religious clerics repeatedly forbid emigration from Yesha -- to no avail. The Arabs of Yesha continue to leave for the Gulf States and Canada. All that we have to do is encourage and aid them. 200 billion dollars that we spend every decade on security guards, fences, roadblocks and social security payments to the families of the dead and wounded would amount to about one quarter of a million dollars for every Arab family in Yesha. How many of the millions of Moslems who have immigrated to the West in the last decade have had that sum in their pockets? This option is a one time investment. Afterwards, we will be able to invest in our own education, infrastructure, families, etc. The Oslo option, on the other hand, is a never-ending investment. After we invest another 200 billion dollars to raise the height of the Separation Fence to anti-Kassam levels, the Iranians will develop a new missile that can fly even higher. Then we will need another 400 billion to raise the fence once again. It all seems so simple. But will we be willing to admit that this really is our land? Of course not. It’s easier to send our troops into Gaza. With tensions rising with Syria, I’ll remind the readers that I wrote here that we will soon be at war with Syria. The only question is when. 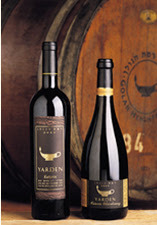 I don’t mean to sound blasé, but I stocked up today on Golan wines and bottled water. Wake up, the war started this morning. Won’t be a war (and Peace with the Palestinians is sooooo close). Jameel wrote about it too. It's going to be Israel's 60th birthday. 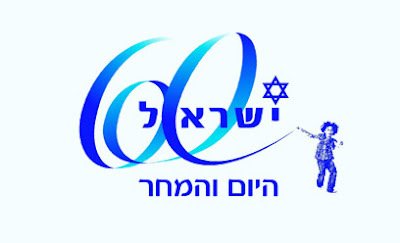 The Knesset decided on the logo below as the symbol for the year. Not to affect the vote (see below), but I like it. Shas Minister Yitzchak Cohen doesn't like it (he thinks the kid needs a haircut). Personally I think it needs a little orange, but it's nice that they decided to use a Na'ar Hagivaot (Settler) for the child. I can't quite figure out how to properly spell yamulkas yarmulkes. (Not to mention, Talleisim, Benchers, and Challah Covers). Its the second day of school in Sderot, and Israeli Prime Minister Ehud Olmert and Education Minister Yuli Tamir promised that it would be safe for Israeli schoolchildren to go to school. This morning on their way to school, the "Color Red" missile warning system blared, sending children scampering to safety in the school building. The Palestinian Qassam rocket landed only 100 yards from the entrance to the school. This video is being released on the Muqata -- the first showing in the JBlogosphere. It actually took one day longer than I thought it would for the parents in Sderot to pull their kids out of school. Unless you are living in Tel Aviv, you obviously know already that Sderot is subject to Kassam attacks every day, and apparently the genocidal palestinians are targeting babies (like always). One rocket today just missed a baby day care center, while another fell near a school. A number of kids were sent to the hospital in Ashkelon. Despite their best efforts yesterday, the palestinians managed to miss the schools, but it must have just been an off day (Labor day weekend and all). But not to worry, their aim improved today. I'm glad Yuli Tamir said she approved the opening of the schools and was willing to take "responsibility". Of course in Israel's government, taking responsibility doesn't carry with it any consequences, which of course means she and Olmert continue to sit comfortably while Sderot's children sit in hospitals (and Peres can become President).